When you set out for work, it is best to be equipped for the worst. This includes the worst in terms of weather especially. Dressing for the weather appropriately can make work much more comfortable. Carrying an umbrella or a coat that matches your attire can make you look both trendy and well informed. 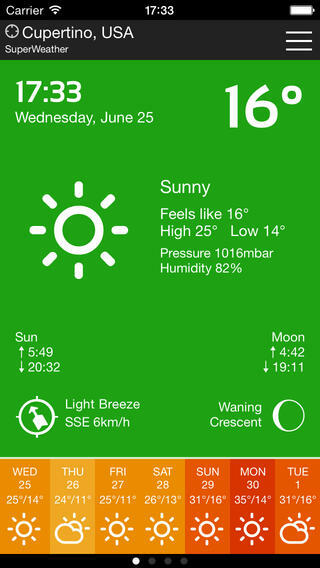 SuperWeather App Free by Superdik B. V. predicts the weather accurately for you so that you can equip yourself well. This iOS app not only gives you the current weather conditions but gives accurate predictions as well. There is a 24-hour forecast as well as a 7-day forecast available. To add to the convenience factor, the weather is available in many forms for you to choose between. You have a choice between Fahrenheit and Celsius and kilometres per hour and miles per hour. Besides just displaying the weather locally, this app also has another unique function. It combines a weather app and a time app into one, displaying time and location. Thereby, you can use this app for multiple purposes. All weather forecasts are shown on the map on a forecast timeline. To view these, you have to merely rotate your screen. The weather info provided by SuperWeather is complete and varied. Factors such as humidity, pressure, wind speed and direction, and precipitation are clearly mentioned. Also, moon phases, moonrise and moonset, sunrise and sunset timings are shown daily. This is all the essential information you need to set out and plan your day. To keep your family and friends informed about your whereabouts and health, you can share weather conditions on Twitter and Facebook. The user interface of this app is quite bold, clean and colourful. It is extremely intuitive and easy to use. All information has been organized neatly with a simple design. This shifts the focus of the app to its functionality. A bright array of colours adds a lot of life to the app indeed. This, combined with the weather forecast symbols make the app easy to read and highly functional. The main screen provides all information about the current weather, avoiding the need for looking around for it. The navigation is very simple too. To view different locations, you have to swipe horizontally. To switch between 7 day forecast, 24 hour forecast and current weather, you have to swipe vertically. In order to delete a location, you simply have to swipe it to the left from the Locations screen. To view or hide the toolbar, you only have to press and hold for a short time. This weather app is available in 15 different languages and is compatible with iOS 6.0 or higher. Additionally, it requires 9.3 MB on your iOS device. 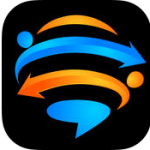 It is presently available in the App Store for free. 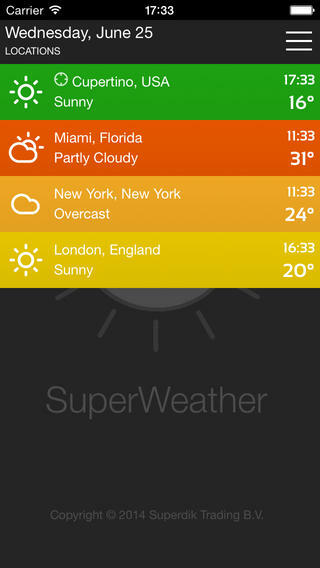 To sum things up, SuperWeather is a functional app with an excellent user interface and intuitive navigation. It provides you with information about the current weather and also weather forecasts up to a week so that you can plan out your schedule well in advance.